Yesterday I made soap. Some to sell and some for us to use. 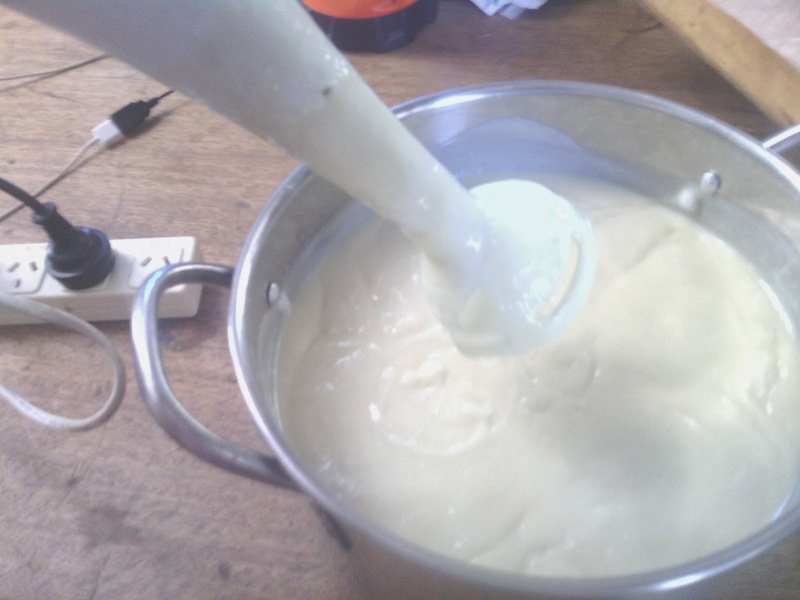 In the past I have found that making one batch every three months or so gives me enough soap for the family, for gifts and for selling at markets and such. Soap making is an interesting (and sometimes dangerous) pastime, but it is economical and useful (for the cost of buying four cakes of vegetable oil soap I can make forty two cakes). 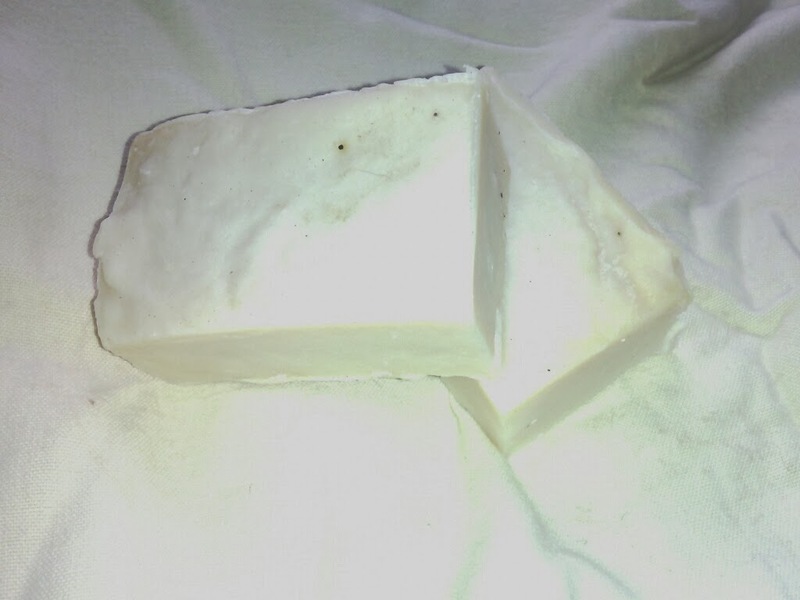 I thought I would share my basic soap recipe and some tips I have discovered over the last decade or so……. Add caustic soda to the water in a large heat proof container (stir carefully and add caustic soda slowly). Combine oils and waxes in a stainless steel boiler and heat to 38 degrees Celsius. When both solutions are the same temperature (use a candy thermometer to test this) slowly pour caustic solution into the oils. Stir this mixture for several minutes with a long spoon (being careful not to get the liquid on bare skin). Blend the mixture with a stick blender until it thickens (reaches trace). Pour the mixture into molds and leave (covered) to set for two days. Remove soap from molds and stack (with cakes not touching) for six weeks to cure in an airy, dust free environment. 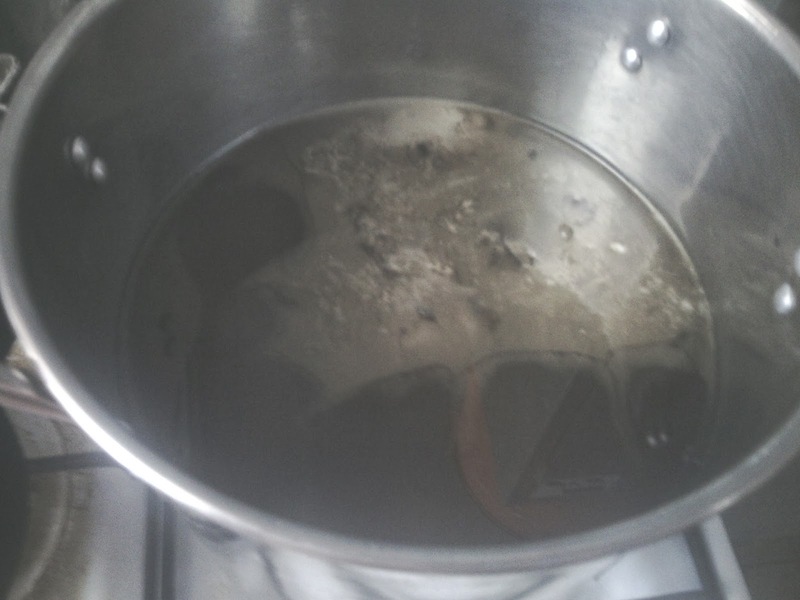 Oil, bees wax and caustic soda, waiting to be soap. 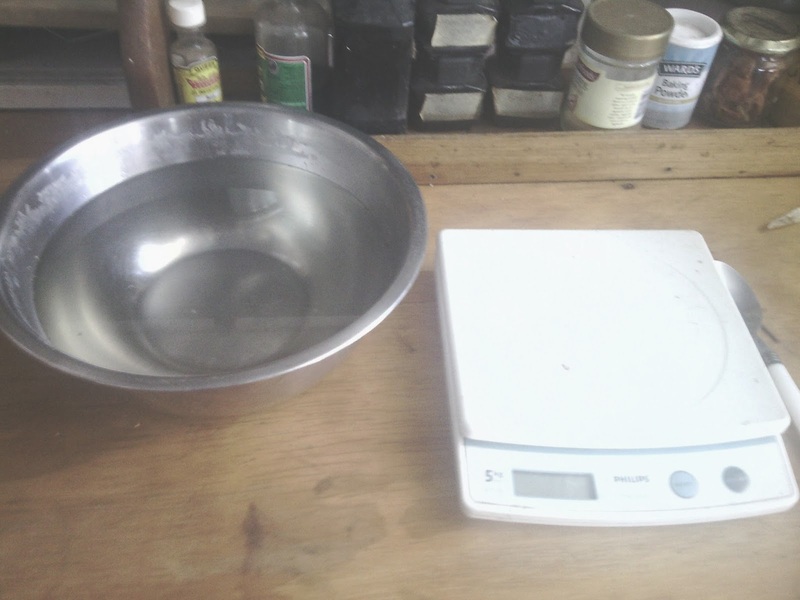 Water and the kitchen scales, all set up and waiting. Oil and wax combined and heating in the boiler. My you beaut, flashy, expensive soap mold. It makes 42 approximately 100g cakes when you use the amounts in my recipe. 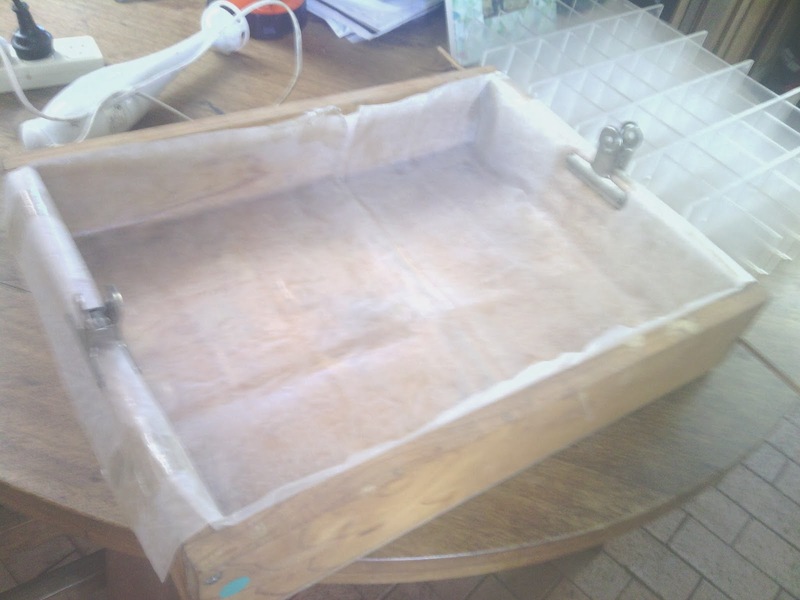 I line the mold with a thick plastic sheet because the caustic soap would damage the wood of the mold. 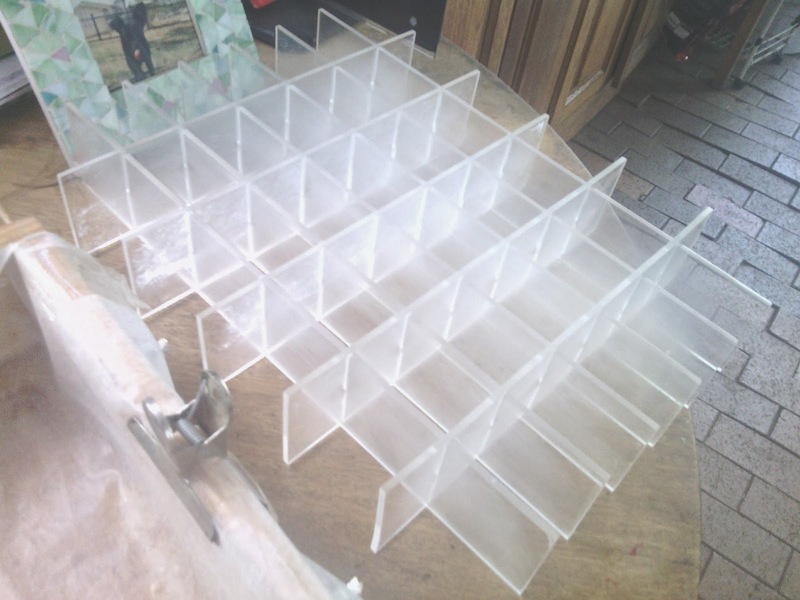 The perspex grid divides the soap mixture into neat little cakes. 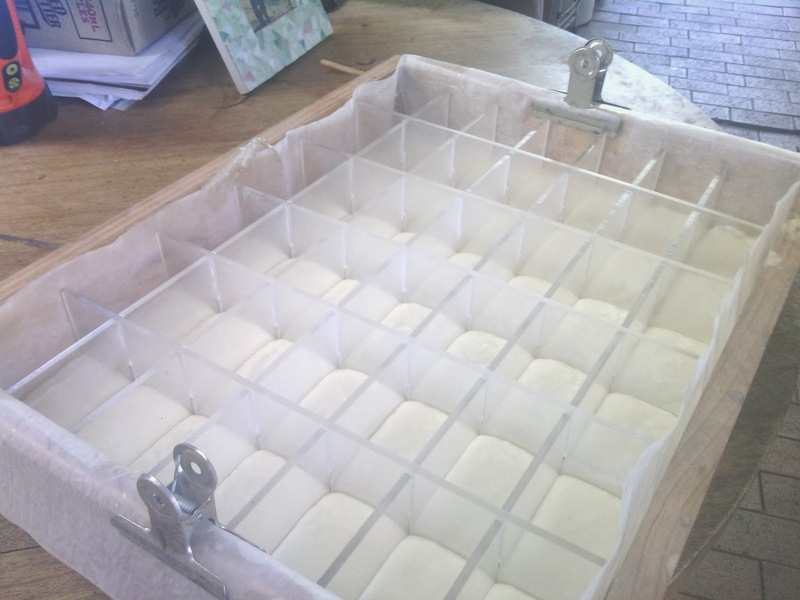 I pour the mixture into the wooden mold, then push the grid down into it. The soap mixture after stirring but before blending. Blending in action. 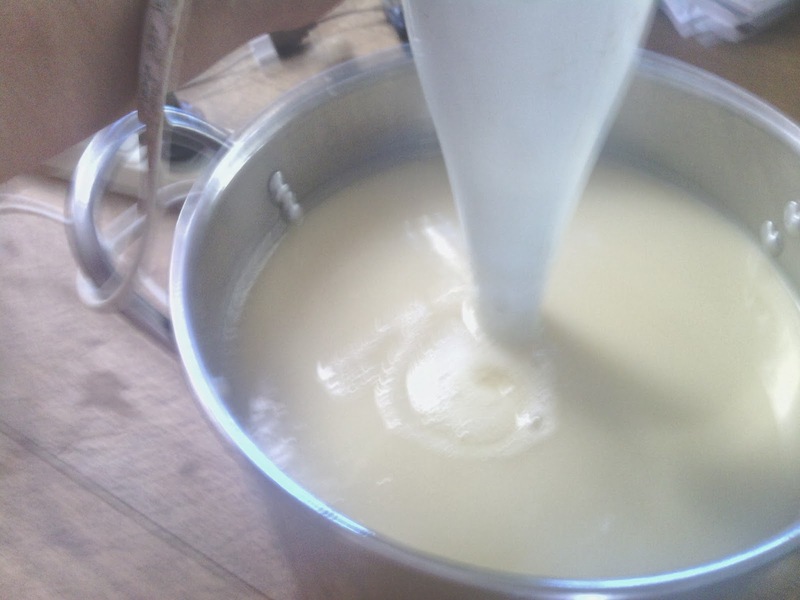 You don’t need to blend the mix to make soap, but it does make the process much quicker. See how the mixture changes colour as it begins to become soap. You can see the soap is now thickening; the dribbles from the blender stay on the surface for a while, that is called ‘trace’. Neat little cakes of soap, hardening slowly. Gather all the ingredients together before you start. Rushing around the house looking for the thermometer or the blender tends to mess with your equilibrium. Use a good thermometer. I use Fowlers Vacola thermometers for my soap, but while the backing is stainless steel and the thermometer itself is glass, the ties that hold the thermometer to the backing are just alloy; this often results in the thermometer falling from the backing into the mixture as the caustic eats through the metal. 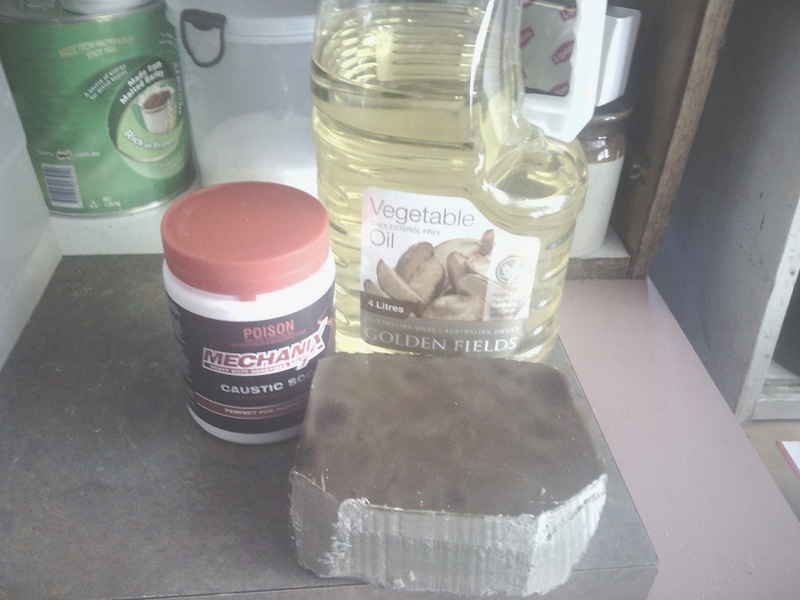 Use stainless steel and heat proof glass and plastic to make soap. The caustic soap solution will eat through just about anything; I have made interesting patterns on my old wood table with spilled or dripped mix (it is useful to clean the black stuff off the backs of baking trays though). Wear shoes, long clothes and gloves while making soap. I have spilled soap mix on my feet before and given myself an accidental chemical peel (on the up side, my feet looked ten years younger for a year or so). 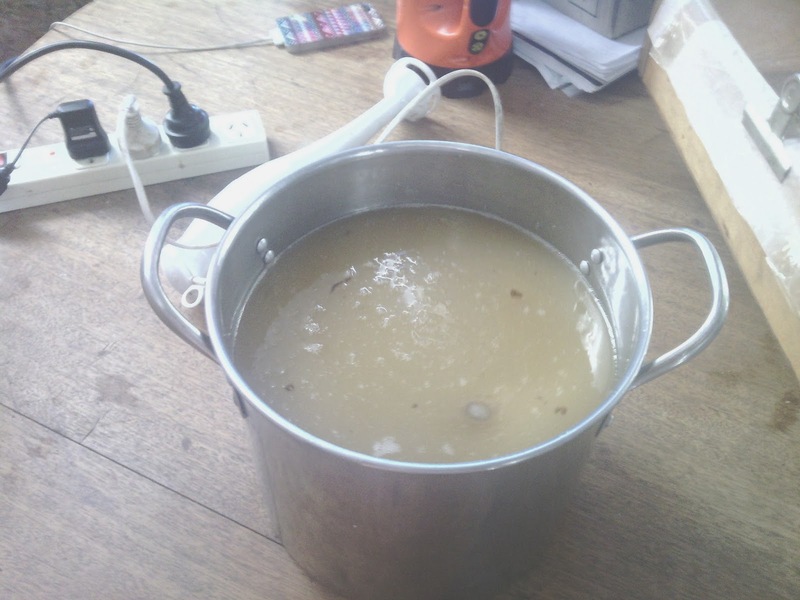 Be careful with the caustic and water mix, the fumes can be very strong and they are dangerous. 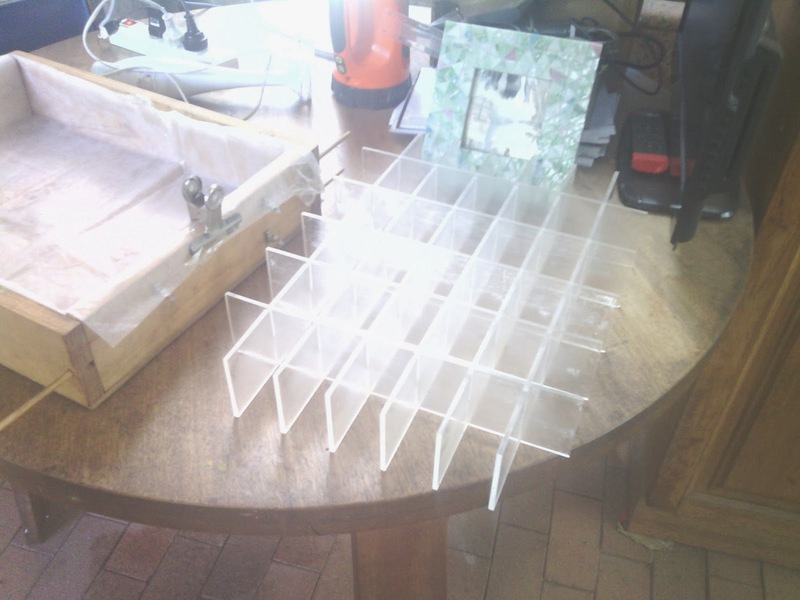 Make soap in a well ventilated area and keep children, dogs, husbands/ wives/ partners and stray feathered friends well clear (I had to lure Roadie the butcher bird away with meal worms and cheese). Don’t leave the cakes to air outside or in an exposed position (Currawongs think they are cheese and fly off with them). Store the cakes in a well ventilated but safe area to ‘cure’. Finished cakes, waiting to be stacked to cure. Have you made soap before? Have you ever wondered at the miracle of chemistry that happens so we can be clean? Apparently, soap was discovered in ancient Greece (by women, of course). The temple of Zeus on Mount Sapo sacrificed bulls regularly by slitting their throats and burning the bodies, over several thousand years the fat from these sacrifices mixed with ash and seeped down to a pool beside the river. Women coming to the river to wash clothes discovered that the slime from this pool made the washing extra clean and eventually figured out where the slime came from and how to make it. Soap was born.